I've seen #16 in person. The color is more of an even, dark brown with no active rust. The proportions and construction seem to be good and the irregular oxidation pattern is difficult to mimic with most accelerated aging techniques. Can you post some photographs of antique swords, perhaps in a separate thread, that display irregular oxidation patterns and explain what to look for? Just come across this thread on returning from a holiday. Some stunning examples, even if some might be dodgy (I haven't the experience to tell). Thanks for posting them, Nathan. While totally unqualified to have an opinion on these examples, I'd like to point out that various museums conjecture on the 'genuiness" or not of some of them could simply be due to the lack of verifiable provenance. IE. - there is no reliable archeological evidence of exactly WHERE they came from or the dating of the site. Items, no matter how valuable or significant they may appear , if they are not archeologically verifiable can always be questioned. Just because a sword has maybe been in a very reputable collection for the last 100 years or so, and labelled as "Viking" ( or anything else) doesn't necessarily make it so. Note - given what I've said - that would negate 90% or more of the items gathered before todays more rigorous archeological techniques. So..my comments should be read mainly as referring to NEW finds, occurring now or within the last 15-20 years or so. What if someone forged a pattern welded blade, artificially aged it, and put it up for auction for €20,000 to €50,000? Would that be worth their time? 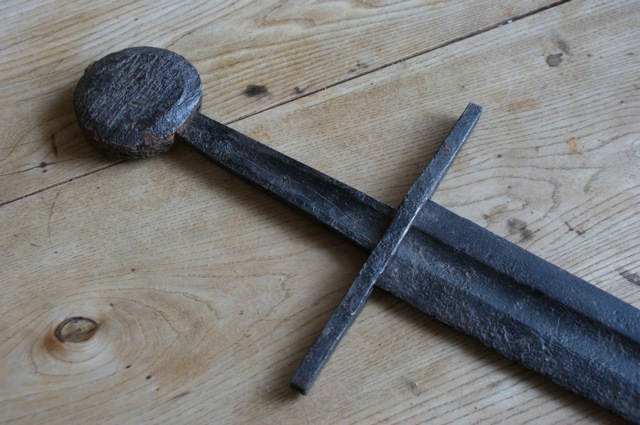 It's not just museums who purchase antique swords; it's private collectors as well. €20,000 is a tidy sum of money for a blade; I'd be willing to bet it's at least three times as much as most modern makers receive for their pattern welded blades. I would assume that good artificial aging takes time, but really, it's somewhat similar to waiting a few years for an investment to grow in value: there's comparatively little work for a high pay-off. A sword like the one attached below does not involve so great a labour investment, if you think about it. I am almost 100% convinced it is a modern fake. I don´t know what price this sword fetched so I cannot say what the profit margin for the faker is. Also factor in how much the middle men are skimming of from this price. I would suspect that there is a line of dealers who introduce these fakes on the market, each one securing some income from the traffic. Making a modern "authentic" ancient sword also reduce the amount of work you have to invest in finish because of the drastic patination. The surface will be destroyed in the acid bath anyway. No need for time consuming file work and hand polishing. The sword will only look better if it initially has a number of irregularities, dips and divots before it is dunked in an acid bath for a couple of days. You can leave it as forged, essentially. That means you skip perhaps three quarters of the production time or more. Also very little need for careful fitting of the parts. In the case of the sword below: simply twist two bars of wrought iron, weld them together and forge a blade blank out of them. Then weld on the letters (and this would be the real time intensive part of the work in this particular case) and forge the blade to shape. Leave the hammer marks as they will look like rust pits after acid etching. In many of these forged blades an inlay has been achieved by simply making groves in the form of letters with a rotary file, or similar. After acid etching this looks like iron inlay that has fallen out or rusted away. Note that it is common to see fake swords with completely missing iron inlay. Blades with only parts of the inlay remaining are less common in fakes, as that is much more time consuming and difficult to make in a convincing way. Thanks for sharing your expertise Peter. Interesting point about the "missing" inlay... definitely something to keep in mind in the future. So when an auction house runs an auction on something like this...is it basically 100% up to the bidders/buyers to determine if its authentic? Or are there other parts to the whole process that deems the piece "authentic"? How does all of that work? I would assume a lot should go into establishing the history of the sword, where it came from, how it was found etc to try and scientifically prove it is real. For the price that sword apparently sold for...if it is indeed a fake, wow . Really unbelievable. The problem is that the vast majority of surviving swords do not have an "unbroken" provenance. Craig Johnson just recently explained to me how most swords available to collectors go "black", meaning their provenance is unknown when the sword goes back on the market. Besides, even sword provenance is not that meaningful anyways. 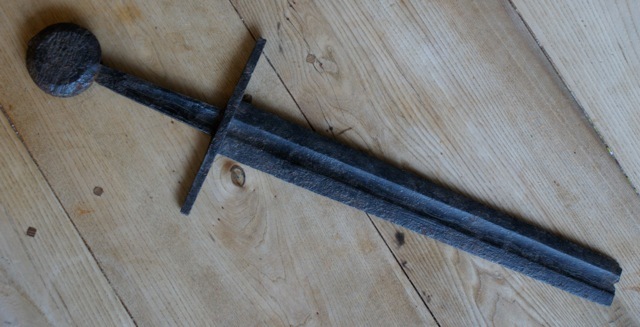 Someone who wants to sell a fake sword can declare "Ground find from Bavaria (or wherever)". How do you know? They can probably even give you a fake document from someone certifying the sword is an authentic antique, if they really want. Also, it's not really in the best interest of an auction house to do a super careful scrutiny of artifacts. After all, the auction house makes 20% of the sale's price. If the item is a fake, they can always say "Mistakes happen sometimes." I would hope that auction houses would do better than this, but given that myArmoury's experts have spotted more than a few highly probable fakes, you have to wonder. There's not much that can be done other than getting expert testimony, or slicing off a few mm to do scanning electron microscope analysis, and maybe some X-ray images. But you need to have a substantial library of genuine antique sword SEM images to compare against, meaning there's very few labs with people who can do it. The cost is around $1,000 USD or more, and who trying to sell an artifact wants to scan it only to discover it's a fake? The problem with that approach is that I feel that if you're selling a sword which purports to be an authentic antique, it might behoove you to verify it to a certain degree. With something as blatantly fake as that Viking sword that Peter posted, one would do very well to request at least some provenance beyond "here's a historical sword, I swear it's a real antique". For example I saw a Bonhams (I think) catalog for an auction happening this year. They had a number of Islamic swords, and went to the trouble of having Dr. Khosarani himself certify them. While I can understand not wanting to go to that extreme (paying a notable scholar to look over the pieces for sale), one could at least forward the piece for a cursory analysis before accepting it for sale in the first place. Thanks for that Peter. Very interesting photos. The things that get my radar "pinging" immediately on seeing those photos was not the iron inlay (I couldn't actually tell it was missing, the photo looked like it was sitting proud of the blade), it was the lack of a separate steel edge welded on (I've never seen swords of that type where the twisted pattern goes right to the edge), and the way the twisting runs up the tang - it just doesn't look "right". Sometimes it isn't about identifying exactly what looks wrong, but knowing from seeing pictures of lots of swords that things don't look right. The aging is also too deep and consistent to be either ground buried or river found, and totally wrong (and inappropriate) for one that has hung in a building like a church for centuries. Here is an example of a fake iron inlay that has "fallen out". 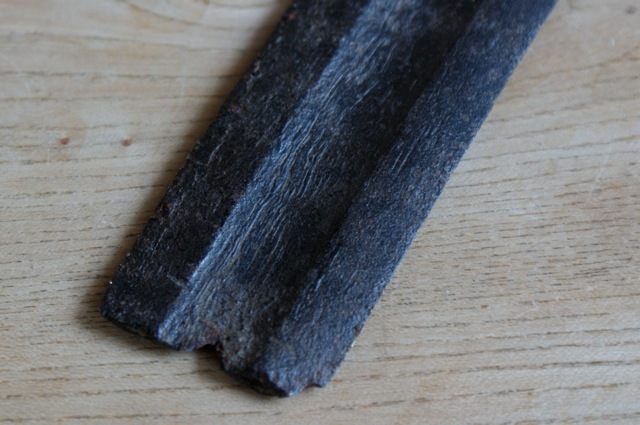 It was formed in the wrought iron blade most probably with a rotary file before being thrown into the acid bath. -Note that it is written the wrong way: reading towards the hilt, not towards the point as it should be. The iron of the blade can be an old wheel rim or a part of an old iron fence. Such iron has a lot of character that shows up when etched. Attached below is a sword that is not of viking type, nor from the viking period or even from the medieval period. It took an afternoon to make and spent a week to develop patina. It was forged out of an old wheel rim and left mostly as forged. I made it as an experiment to see how easy it would be. There are many things about this piece that shows it to be what it is and it is naturally not intended for sale. I use it to show customers why it is good to be wary of claims to authenticity. -The red rust has developed over the years since I made it. Originally it was all a warm dark black.